Construction of a pole-top distribution station (PTDS) on Temescal Canyon Road, just below Sunset Boulevard, was halted last month because it lacked a coastal permit. “We stopped it in mid-progress,” said Bill Harriot, Los Angeles Department of Water and Power electrical service manager. Two 60-ft.-high poles were installed on Temescal in July and remain in place, awaiting a resumption of construction. This pole-top distribution station was put up without Coastal Commission approval. A public hearing was held on Oct. 18 at the Palisades Library, led by Catalina Hernandez, environmental supervisor for the City of L.A. Department of Public Works. According to Hernandez, the city can issue or deny a coastal permit, based on several criteria, including “Would it affect coastal view or coastal access?” and “Would it affect a biological habitat?” A city recommendation then goes to the California Coastal Commission for final approval. The next day, Oct. 20, the city approved a Local Coastal Development permit without conditions. Provided that no appeal was filed by Oct. 31, the Coastal Commission will review the proposed development and, if in agreement, will issue a permit to the DWP. If there are no further unforeseen delays, the Temescal project could resume in about a month. An underground vault needs to be constructed, and conduits and cables laid. At the library meeting, Herriot said that El Medio/Sunset was the DWP’s preferred site because of cost ($240,000 vs. much higher on Temescal) and proximity to an existing underground vault—60 ft. as opposed to one 500 ft. away (which will necessitate working on Sunset towards Gelson’s). The more isolated Temescal site was chosen after the proposed El Medio site drew intense dissent from neighbors. 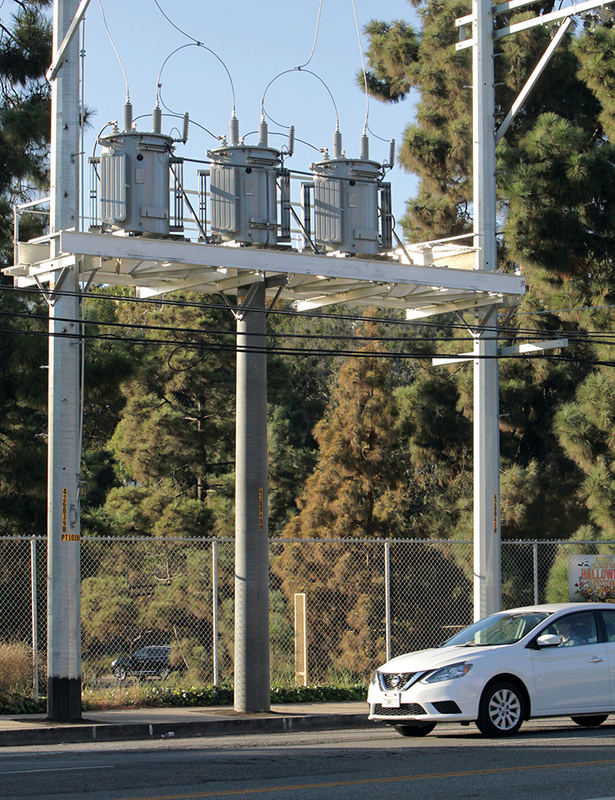 The pole-top project was initiated in January to help alleviate the overloaded circuits that serve Pacific Palisades. According to the DWP, the current distribution station, built in 1935 at Via de la Paz and Sunset, has been operating beyond its capacity for years. A new substation is needed for this area, but until one can be built, the two poles on Temescal will serve almost as “extension cords” to the areas west of the high school. At a March meeting held at Marquez Elementary School, Councilman Mike Bonin listened to complaints from residents about the proposed locations (a second tower was to be built on empty DWP property just west of the school’s lower playground). Many residents objected to those sites, and two new locations were chosen: Temescal Canyon Road above PaliHi’s baseball field, and at 17000 Sunset (the site of a proposed but rejected condominium development). Residents who live in apartments and condominiums on Temescal between Sunset and Haverford were not given notice that the pole-top site had been moved from El Medio to Temescal.